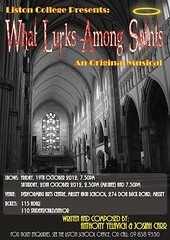 REVIEW: "What Lurks Among Saints"
On Friday night I had the pleasure of going to see the Liston College musical, "What Lurks Among Saints". Never heard of it? That's because it is new, brand new! An impressive feat for any school music department, even more so when the script and music is written by students and the director is the head boy. I met the composer, Josiah Carr, at an APO Open Day earlier this year where he came and said hello. He mentioned then that he was writing a musical and although being mightily impressed, I was well aware of the massive amount of work it takes to put a musical on to the stage. So, I was pleasantly surprised when he emailed me recently to invite me to opening night! "In 1962 the townspeople of Chicago are gearing up for what seems to be another dreary election. After a year of mismanagement under the current Mayor the citizens are looking for a change. Victor Whitman is a newcomer to Chicagoan politics and seems to have stolen the attention of many of the townspeople including the determined businesswoman, Angelina Iverson. CEO of the largest stationery company in the Mid-West, she recently has had the Mayor at her beck and call, but seems to be abandoning the sinking ship. Her sights are currently set on expansion of her company and monetary gain, with acquisition of the foreclosed Chicago downtown Cathedral on the agenda. However she is meeting resistance from Stanley Glasgow, the manager of the downtown bank currently in possession of the church. Not that the church was going to put up without a fight, the clergy are set to try anything they can, even if it means to back the unpopular Mayor." Rosalina Rodriguez arrives to the convent in Chicago, a happy, optimistic novice sent from California, unaware of the struggle the church is facing. Her presence seems to have an uplifting effect and the church seems to gain traction. But when everything starts to look hopeful, catastrophe strikes – a catastrophe which turns Chicago upside down. Tension is high, romance is evident, and Chicago is in chaos. Lives are at stake, as everyone is searching for, what lurks among saints." So, there is a lot going on. The "Inspector" did provide a short introduction but it was the first of many dialogues (or songs) not entirely comprehendible due to the band being too loud. This was an essential dialogue considering no one in the audience knew what it was about. A short synopsis or "scene-setter" in the programme would have also been nice so we could enjoy and understand it right from the beginning. The band was made up of a flute, 3 clarinets, soprano saxophone, 2 alto saxophones, tenor saxophone, bass clarinet, 2 trumpets, trombone, drums, piano, synthesizer, electric and bass guitars and 2 violins. A nice group, and they made a great sound, but I wonder if the instrument numbers were too large for this setting and a smaller group would mean more control over dynamic contrasts and problems wouldn't arise like mentioned above. The music itself, however, was very well developed. It fitted the 1962 Chicago setting and as well as being stylistically aware, it was clearly original and gave the production a unique sound. Themes were well used, recurring as they should and providing a clear musical element for our ears to catch on to. While the full ensemble writing was indeed very polished, more variety with smaller combinations of instruments and different textures/colours could add even more strength to the production. There was some great links between the music and comedic happenings on stage, and some very fine moments of ensemble singing. The performance of the music was good, clearly a lot of work had gone in. The rhythm section was a real asset and the brass in particular managed some very high and exposed passages impressively. Josiah very securely conducted the ensemble and the only minor slips came due to either him being not well illuminated or due to the bulk of the musicians being quite a distance away. On stage it had everything it needed - romance, death, humour, intrigue, religion, politics, scandal and more. The lead characters all had a lot to offer, some great stereotypes and some fantastic lines to amuse us. There were a lot, however, and all coming at the story from different angles so there is a lot to keep on top of. Being a musical, you do expect a script with twists and turns, fantastic music and... choreography. I was a tad disappointed that there was no dance sequences until the very end. It was good when it came, but it is a key element of musicals so would have been nice for some more. Dance sequences are also a chance for the music to shine and for the musicians to let loose. My wife and I both thoroughly enjoyed the production. Huge congratulations to Josiah Carr (composer), Anthony Yelavich (script-writer) and James Devereaux (director) for creating and producing a very enjoyable and successful show - an accomplishment many only ever dream about. Major kudos also needs to go to the music department and school for giving the students this opportunity and supporting it through the final step. Read a newspaper article on the three students here. The production had three shows on 19th and 20th October at the Massey High School Performing Arts Centre. It also involved students from St Dominic’s College.